I possess a Daredevil-like sense of smell. I notice aromas floating in the air that few people do, from potpourri, blooming flowers the next block over, sauteed onions from outside the front door and — my least favorite thing on the planet — incense burning in a nearby apartment. Inherited from the chef-side of my family, this intense sense is both a blessing and curse, since there are also plenty of not-so-fabulous aromas floating in the air too. As you likely know, taste is heavily dependent on smell (think about when you have a cold) so my taste factor is also influenced by this, ahem, blurse. But that’s where tasting wine becomes really cool. I smell and taste a lot of things in a wine. Like green pepper(aka pyrazine vegetal-ness) in many Chilean Carmenere wines. I whiff it first, then it bursts into my mouth. Generally experienced in grapes that haven’t ripened enough, the green pepper experience in Carmenere is part of its DNA. I never warmed up to this flavor and still don’t care for it. So when I get a sample bottle of Carmenere, I’m rarely psyched. However, the Anderra 2013 Carmenere surprised me. It helps that the wine is is the Chilean project by Baron Phillipe de Rothschild. Yep, that Rothschild. As we emerge from the doldrums of the economic downturn, people are rediscovering sparkling wine and Champagne. Bubbles can be sanity-saving– salve a bad day, make Meatloaf Night an occasion or help celebrate a holiday. Luckily these days, high-quality sparkling wine comes in all price points. So whether you have a Hamilton or a Franklin in your wallet, it’s easy to toast to the good life. In the $10 – $25 range, the choices appear endless. From super affordable Italian Prosecco and Cava to carefully crafted Californian sparklers, the wine lover wins. Most French Champagne and American sparkling wines are made from Chardonnay and Pinot Noir grapes (a third red variety, Pinot Meunier, is often blended in). 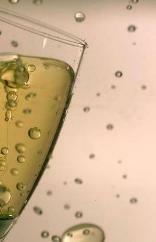 But Italian Prosecco and Spanish Cava producers use indigenous grapes that are easier and less expensive to grow. And, as the infomercials say, the savings are passed along to us. From the north-central region of Spain famously called Rioja comes an exceptional example from a wine area finding its own again. Welcome back earthy, robust Rioja. You took a trip to a few famous wine writers’ palates and thankfully, you came back to your authentic home where you belong. By Spanish law, a Rioja Riserva must be aged in barrel for two years then held in bottle for another two before release, so thus the 2008 vintage. It’s one of the only wine regions that sells its wines when they’re ready to drink. A blend of 80% Tempranillo, 15% Garnacha (Grenache) and 5% Mazuelo grapes, the Rioja Bordón Riserva has characteristic Spanish dustiness tinged with black cherry aromatics. It’s best enjoyed after being decanted for 10-15 minutes, to bring out its inner beauty. Rioja Bordón sports a personality of a warrior who secretly likes rom-coms — some flavors of strong brewed tea, smoky oak and a touch of silky tannin, balanced with the soft fruitiness of black cherry, plum and blackberry. Food friendly and enough acidity to stand up to a long list of fatty foods — from grilled ribeye slathered in a spicy rub to aged cheeses like Parmesan Reggiano. A fantastic effort for an obscenely low price. It’s not often that a whole group of knowledgeable wine drinkers gasps when a bottle is revealed during a blind tasting. That happened when this Trivento 2013 Cabernet Sauvignon peaked out of the brown bag. The reason for the shock and awe? It only costs a humble $12. Yep. And its quality to value ratio is pretty impressive. As are its landholdings.